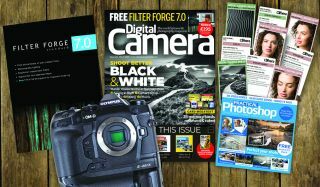 £195 of free Filter Forge software with Issue 213 of Digital Camera World magazine! We've gone black and white for this month's lead feature in Digital Camera magazine, with 12 pages of hints, tips and tutorials devoted to this enduringly popular area of photography. And our bonus gift this month is Filter Forge 7.0 - a fully-functioning effects suite for Mac and PC users that is worth £195. But we start the issue in glorious colour, on location at a classic car rally with leading automotive photographer Amy Shore, for our One to One pro masterclass. Feeling inspired after seeing some of Amy's beautifully crafted images? Then go straight to our Photo Active section. With a wide range of projects to choose from, including fine-art mono, fast action, macro and astrophotography, there's something for everyone. Regular features this month see White Balance covered in Camera College, while our Practical Photoshop section offers tutorials on correcting distorted perspectives, HDR toning, how to bring out mood and detail in macro shots – and much more. There are more technical smarts in our Photo Answers section, where we take queries from readers and critique some of their latest submissions, in Photo Answers. And this month’s ‘Six ways to shoot…’ focuses on photographing light trails. Also in the March issue, we go all Shakespearean on a reader Shootout in Stratford-upon-Avon, and find out more about the career and work of Pete Souza, official photographer to Barack Obama. The March issue's lead camera review is the Olympus OM-D EM-1X, a Micro Four Thirds mirrorless that can also shoot images in medium-format resolution. Also appearing in our Kit Zone section are the Sigma 70-200mm f/2.8 DG OS HSM Sports and Tamron SP 15-30mm f/2.8 Di VC USD G2 lenses. Our group test comprises a nine-page face-off between 39 memory cards – don’t buy another capture card without checking our best-buy recommendations across the SD and CF formats. Every issue of Digital Camera magazine is packed with tips, techniques, pro advice, reviews, news and inspiration. To make sure of your copy every month, subscribe at our online shop from just £12.50! You can buy limited back issues of Digital Camera magazine in print at our MyFavouriteMagazines secure store.